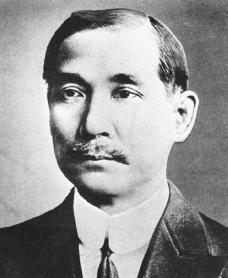 Sun Yat-sen was born on November 12, 1866, into a peasant household in Choyhung in Kwangtung near the Portuguese colony of Macao. His father worked as a farmer, which had been his family's traditional occupation for many generations. His early education, like his birthplace, established him as a man of two worlds, China and the West. After a basic training in the Chinese classics in his village school, he was sent to Hawaii in 1879 to join his older brother. There he enrolled in a college where he studied Western science and Christianity. Upon graduation in 1882, he returned to his native village. After learning about Christianity, Sun had come to believe that the religious practices in the village where he grew up were nothing more than superstitions. He soon showed these changed beliefs by damaging one of the village idols and was banished from the village. Can anyone tell me who was his personal assistant in his last days? I think it might be my grandfather. Just want to be sure. Thanks.